Since I’m a science fiction writer, you can safely assume that SF is also my favourite thing to read. So when my writing is published in an anthology or magazine, it’s the best of both worlds—reaching new readers, and getting to read the other great offerings in the collection. I’m pleased to have a short story included in the recently published anthology Future Visions Vol. 3 edited by Brian J. Walton. And proud to have work in the same company as these excellent tales. Margery Bayne’s Another Life distills a looming moral dilemma down to just two people in crisis as a woman named Dana wakes up, only to be told that she’s been in a coma for 23 years. Exploring love, memory, obligation, and a slippery slope of personal rights, Another Life is, above all, very human. After All by Bret Carter tells the story of Ben who believes he might be the last true musician because technological developments and corporate greed have warped his beloved art form beyond recognition. But his efforts to fight back unleash a devastating force (and you won’t thank Carter for what he leaves in your brain, either). In Space Witch Yolande Ryle imagines the first manned spaceflight to Ceres. It’s the most light-hearted tale in this collection, even playing with the line between magic and advanced technology, but it explores a question that’s held my interest for a long time: are we Earthlings being watched? And judged? And what if the judgment doesn’t go our way? A Lament For Marla by Mike Adamson takes us to the dark aftermath of climate change in a story that deliberately evokes Soylent Green (by name) but the way its conclusion links hope with degradation packs a powerful punch. Nolan Janssen’s The Running Mill paints the terrible cost of the free market system to a future America where the jobless poor run on treadmills to produce clean power. But when one talented runner is given a chance to make his mark on the world, the shining dream isn’t all it’s made out to be. A nasty mash-up of social media and the self-improvement mania takes a frightening twist in A Century of Faults by Evan Scott Edwards. And a well-meaning attempt to save the world from a growing shortage of bees veers in a disastrous direction in P.R. O’Leary’s Pollen. And there are still more engaging stories by Robert Jeschonek. Michael W. Clark, Joseph Aitken, B.A. Paul, and, oh yeah…me. My story Elysium follows ex-cop Gib Thorne as he tries to solve a rash of seemingly unrelated deaths while coping with his terminally ill mother’s “upload” into a digital afterlife. If there’s life after death, can there be murder, too? 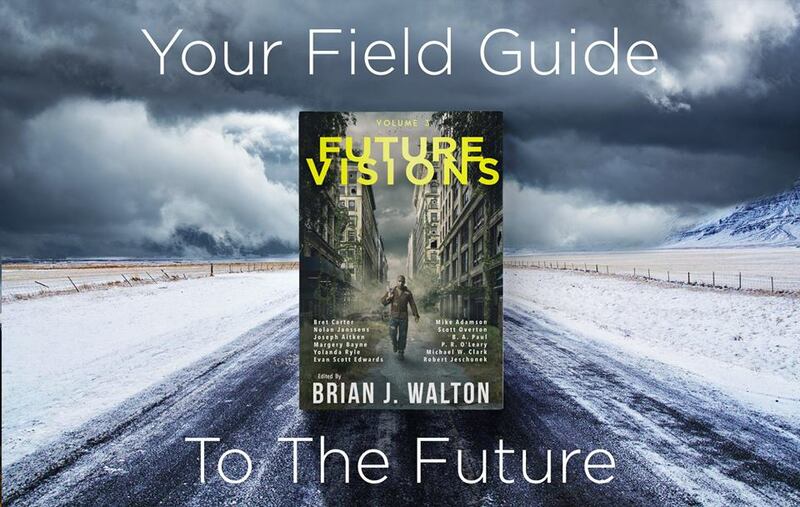 Short stories are like tantalizing appetizers compared to the full meal of a novel, so if you’re looking to stimulate your science fiction taste buds with some pungent flavours, Brian J. Walton is a very savvy editor and I’d recommend his whole Future Visions series—new offerings are published about every two months. Future Visions Volume 3 is a great place to start, available in Kindle and paperback editions. If you’ve read the bestselling SF novel The Martian by Marty Weir, you’ll know it’s not a stretch or an insult to describe it as MacGyver On Mars—the plot depends on stranded astronaut Mark Watney using every piece of available technology, biology, and chemistry in creative ways to help him survive the hostile Martian environment. Weir does it brilliantly, with just enough human touches to keep the reader fully invested in Watney’s survival in spite of numerous technical descriptions that some will find dry. Translating such a science-heavy story into glossy Hollywood entertainment for today’s average moviegoer would seem to be as daunting a challenge as surviving on Mars. Congratulations to Ridley Scott & Co. for pulling it off with flying colours. I hope Hollywood will take the movie version of The Martian not only as proof that science movies can be successful but as a model for how to do them well. When a ferocious sandstorm forces a crew of NASA astronauts to cut short their stay on Mars, Mark Watney (played by Matt Damon) is injured and thought to be dead. The crew is forced to leave him behind and return to Earth. The next Mars mission can’t happen for another four years—Watney has enough food and water for a couple of months. His personal survival and any attempt by NASA to rescue him appear to be impossible. Both will require the utmost in human determination and ability to achieve. In The Martian nearly every character is a scientist—Watney himself is a botanist as well as an astronaut—yet the movie shows that they can be every bit as committed, stubborn, inventive, defiant, funny, sweaty, and courageous as any spy, cop, or soldier. They’re not superhuman, instead they show the best qualities of real human beings and the astonishing things we can achieve. The story isn’t about great feats of daring and stamina (though there’s certainly some of that), but using human ingenuity to overcome seemingly insurmountable problems one step at a time. As the implacable universe throws up each new roadblock, Watney, or the NASA team trying to bring him home, uses brainpower to figure out a way around it. The scientific explanations are necessarily brief but not absent. When a risky course of action is suggested, the pros and cons are explored honestly. The unpleasant realities of both physics and economics are given fair representation and, true to the book, The Martian escapes being propaganda for the USA by giving an important role to the Chinese space program. I’m deeply impressed by how Ridley Scott has crafted a slick and suspenseful Hollywood offering while keeping it so well balanced. Others have pointed out that it is a rare movie full of optimism. Sure, it has moments of carefully-crafted theatre, but it’s inspirational in a true sense and not just emotionally manipulative. I can’t talk about a movie like this without mentioning the special effects and they are terrific—eye-popping and authentic (OK, we wouldn’t hear rocket engines in space and the Hermes spacecraft wouldn’t have such big windows, but otherwise…). The Martian vistas are stunning, well worth the extra price of seeing them in 3D. The movie reportedly cost $108 million USD to make and it shows on the screen. Not all of that is Matt Damon’s salary, though he certainly earns his pay by giving Watney just the right amounts of stoicism and nerdiness to grab the audience and hold them—it could so easily have failed in the hands of another actor. The Martian is a movie without any killing, martial arts, fleets of helicopters, contrived romance, explosions meant to destroy or terrorize, inane humour, super powers or supervillains. So it’s truly a breath of fresh air. I hope box office numbers will show Hollywood that there’s an appetite for this kind of movie and at least one director who knows how to make them.